Playing verb activities and grammar games with your students will get them active in the learning process and will help them solidify the grammar rules and concepts you are teaching in your classroom. Try making a word wall with your students that has three sections for linking, helping, and action verbs. Each student can write their favorite verb on a piece of paper and illustrate the verb underneath. Make sure that the writing is legible and bold enough that the verbs can be seen from the desks of your students. A more efficient way to build the wall might be to assign verbs to each students by handing out papers on which you have already written the verbs in clear, bold lettering. You can devise a lot of verb activities based upon your new word wall: for example, students can be assigned a silly story-writing activity, in which they have to use as many of the words on the wall as possible. One of the most fun verb activities for students is to construct Nicky Noun and Victor Verb, paper cutouts shaped like kids that students can label with lots of nouns and verbs. Make sure you have paper that is large and long enough to have room for two tracings of students. Have two students lie down, and trace their bodies onto the paper freehand. Tape each child to an easel or wall that the kids can write on. Have the students brainstorm a new list of names to vote on for the verb and noun cutouts - aim for alliteration! Start labeling the noun cutout. Label it with nouns that are the parts of the body, the clothes that are worn on certain parts of the body, and other nouns your class can brainstorm. Encourage them with questions that make the cutout have a comprehensive list of all the nouns. Start working on the verb cutout. Using the noun cutout as a guide, start labeling the parts of the body with all of the verbs they can do. For example, the nose on Nicky Noun can be labeled on Victor Verb as sniff, smell, sneeze, and snort. Encourage them to be creative! This project can take a few hours over several days or one long afternoon. Set up five easels around the room with chart paper and markers. Break the students in the class up into five approximately equal groups. Each easel will have differently themed lists to create power verbs. You want to label each list: move, communicate, eat, walk, look. Have the groups visit each easel in a circuit, with each stop lasting three minutes. 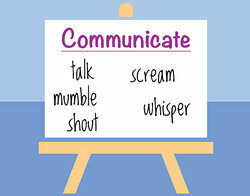 The object is to have them brainstorm as many complex verbs as they can based upon the original theme: communicate can become talk, mumble, shout, scream, whisper…the possibilities are nearly endless. Encourage them to work as a team to come up with great ideas and build the lists. Extend the activity by joining the class together at the end of the circuit, and having students stand and act out each verb. This will burn off some energy with your kids, and will also help them memorize the new words. Surely some of the words listed will be unfamiliar to some of your students, so acting out the verbs will allow them to learn some interesting new vocabulary. Some of your students might be unfamiliar with Chinese Fortune Cookies: small cookies that have a strip of paper with a simple message or idea baked inside of them. Look up a fortune cookie recipe for your students, and get the ingredients at home. On the first day of the activity, have students write "action fortunes" on small strips of paper, of the form "You will ___________ today," filling in the blank with an action verb or linking verb that can be acted out in the classroom, such as "You will jump up and down today" or "You will be happy today." Make the fortune cookies using these strips of paper at home. Then, the next day, distribute the fortune cookies and have the students act out the verbs on their strips. Be sure to get a list of student allergies before beginning any activity that includes food. "Verb Activities." YourDictionary, n.d. Web. 25 April 2019. <https://education.yourdictionary.com/for-teachers/verb-activities.html>.